Although I work from home and tend to be always connected to the Internet, I still find that I really like to use products that allow me to work off-line. Not only is the performance often better, but it’s more reliable and I still spend a couple of hours a day disconnected. lack of off-line support has been one of the biggest issues with SharePoint 2003 and although I have used Groove as an off-line client I have never been that satisfied with it. 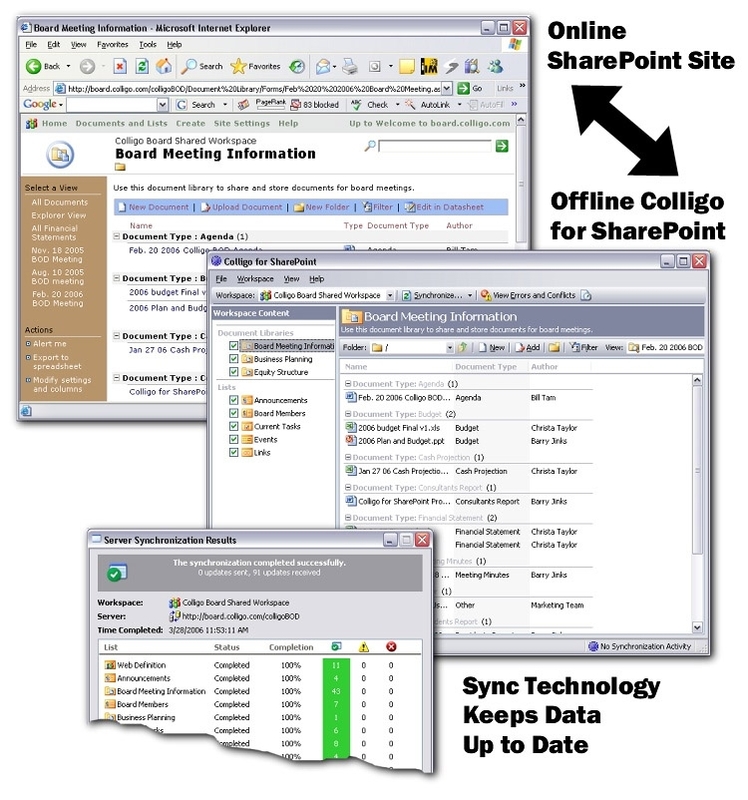 Enter Office 2007, which includes off-line support for SharePoint 2007 primarily via Outlook 2007, but also for specific purposes via Groove 2007, Excel 2007 and Access 2007. Take a look at the demos and you will come away pretty impressed, however that’s the purpose of demos! Take a look at the Offline SharePoint blog and you will get a very different impression. There are many small areas where the off-line experience is just not what you would expect, sometimes only a read-only copy is created, sometimes not all list types are supported, links don’t work – the list of limitations goes on. Admittedly Colligo – the authors of the blog – make their own tool for offline use of SharePoint but they make no secret of that fact. Anyway if you think all your off-line issues are met then think again, check out the Colligo blog and the Colligo alternative (Reader and Contributor)and if you want the best Off-line experience it’s probably still Lotus Notes. It’s interesting though that neither Microsoft nor Colligo make it easy to get a comprehensive and detailed view of what works off-line and what doesn’t and in which products. some sort of mega table is required, if anyone knows where to find that information please post a comment. Too bad there’s not a product on the market today that really does off-line applications correctly. Wait, there is such a product. Lotus Notes has been doing offline applications for well over a decade and it’s not a trimmed down version of the on-line application. We’ve done a lot of analysis of all the competitive solutions and, as you mentioned, there are a lot of subtleties in what works and what doesn’t. I think that there is a lot of confusion about how much support (or lack of it) for SharePoint offline there is in Office 2007. For example, many people don’t realize that most of the SharePoint features have been deprecated in Groove 2007 and that Outlook only supports one-way sync of documents. Neither of these apps support custom metadata or SharePoint views. Thanks very much for mentioning our products. We had many years of experience developing offline collaboration products for Lotus Notes before we developed our SharePoint product line. We know that there are many happy Notes users and have tried to take what we learned from them and apply that to SharePoint. Hopefully, you will agree that we actually do offline “correctly”. One final note: We created the matrix that you mentioned, including an analysis of a couple of third party tools, but we don’t plan on publishing it. However, if you are interested, drop me an email at sales@colligo.com and I’ll see if we can provide you a copy. Check out the offline SharePoint experience for MOSS 2007 at http://www.iOra.com/hqportal.htm that large organizations have been using since we originally delivered it with SharePoint 2001. We do cost a little more than the competition, but if you want your end users to require no training to use SharePoint offline, synchronize automatically, scale to thousands of users, search and update when offline, and still work when the web content is not SharePoint, then we’re the only choice. iOra software replicates web applications over wide area networks and guarantees offline availability for remote and mobile users in distributed enterprises. Did you here about ShareGo ?? Have a look at this tool… Offers offline solution for SharePoint and much more.